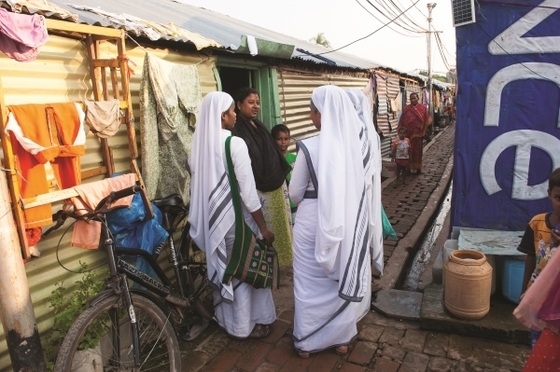 Sisters of Compassion working in Asian slums bring hopeful light into what are otherwise deeply depressing places. Lonely, hurting people are uplifted and renewed by friendship with the sisters and with the Friend who heals their hearts. Two of her children were gone. Missing. Where were they? What had happened? Where had they gone? It was her husband. He had taken them. Taken them and left again without telling her a word. Panic and fear washed over Amlika. What would she do? Who could she turn to? After getting married at an early age, Amlika, now 29, and her husband had five children. They crowded into a single-room shanty in the middle of a slum on the outskirts of a major city. Her husband started drinking. He stopped working. He began chasing after other women. And then he left, leaving Amlika with the responsibility of caring for their children, ages 9 to 3. Loneliness. Agony. Fear. Shame. Worry. Hunger. This was her life. Amlika cleaned people’s homes, but despite her daily labors, she scarcely earned enough to feed her family. And then two of them went missing. Amlika’s husband had come by a few times through the years, bringing a little bit of money for his children, but he had never stayed long. Then one day, he suddenly vanished with two of the kids. A few days passed before he showed up again to bring them home, but it was enough to fill Amlika with fear that she could lose them forever. After that day, she locked the door with her children inside whenever she went out to work. Some GFA-supported Sisters of Compassion served in the slum where Amlika and her children lived. One day, Amlika decided to attend a special Mother’s Day event at the local Bridge of Hope center—the center her eldest daughter had been enrolled in soon after Amlika began cleaning homes. The young mother saw the Sisters of Compassion sharing kind words with other women, and something made Amlika want to talk with them. She asked them to visit her home, and they did. They came to Amlika’s home with eternal love in their hearts. The women talked, and tears flowed down the young mother’s face as she shared about her plight. The Sisters of Compassion comforted her and shared about the One who never leaves us. The women introduced her to a local GFA-supported pastor, who also visited Amlika. Through their faithful companionship and prayers, peace penetrated her fear, truth replaced anxiety, and dignity overcame shame. Amlika (not pictured) once feared for her children’s safety as they stayed home alone while she worked to meet their needs. After receiving the gift of a sewing machine, she can both provide for and protect her children as she works from home. Amlika found a peace that surpasses understanding and circumstances, but she still struggled to provide for her youngest children. Thankfully, Bridge of Hope was taking care of her eldest daughter’s need by providing a daily meal and other necessities. Knowing Amlika could still use some help, GFA-supported workers collaborated to bring her aid. On International Widows’ Day, Amlika received a sewing machine! Gifts like sewing machines, provided through the donations of men and women like you, have changed the lives of thousands upon thousands throughout the years, and Amlika is one of them. Amlika started learning how to use her machine and became confident this gift would enable her to earn more money to provide for her children’s needs. 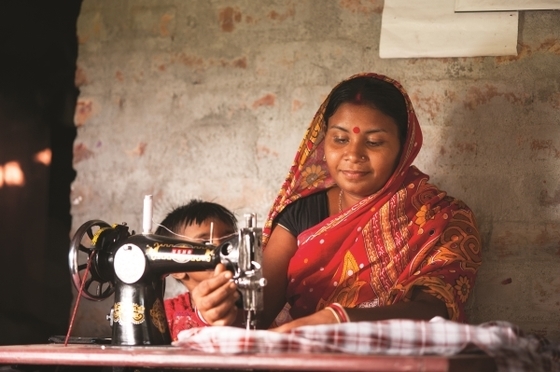 A sewing machine was a perfect fit for Amlika because now she will be able to run a tailoring shop from her own home. That means Amlika won’t need to worry about coming home to find her children missing again. She can spend more time with them, help them grow and love them well.